When you’re craving Asian flavors, a quick dish is just what you need. 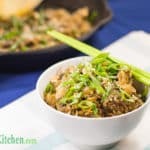 Try our Low Carb Fried Rice with Asian Shredded Beef, it’s ready in under 30 minutes! Place the konjac rice in a colander and place in the sink under running hot water for 2 minutes. After 2 minutes, turn off the water and leave the rice to drain. Place a wok or large non-stick frying pan over high heat. Add the sesame oil, garlic, chili and 5 spice and saute for 2 minutes. Add the scallions and mushrooms and saute for another 3 minutes. Add Low Carb Asian Shredded Beef and combine with the other ingredients and saute for 3 minutes, until heated through. Add the drained konjac rice & tamari and stir well. Push the ingredients towards the edges of the pan, leave a space in the center. Crack the egg into the center of the pan and scrambled slightly, slowly mix the other ingredients into the egg, until the egg is cooked through. Add the pepper and stir well. Remove from the heat and serve sprinkled with sesame seeds.